Organic September is in full swing so I thought I would share some of the organic staples I normally keep in my kitchen cupboards. 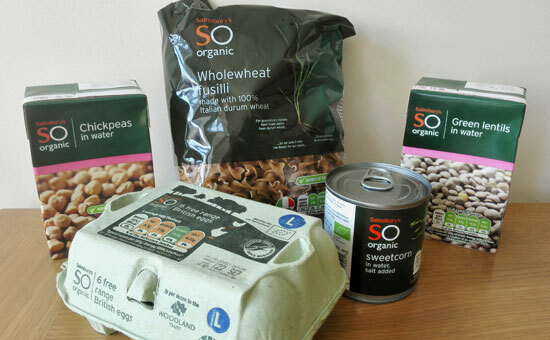 Organic September is a campaign run by the Soil Association which aims to encourage consumers to choose organic products as part of their regular shopping mix. This year the Soil Association is encouraging everybody to ‘look for the logo’ (the Soil Association logo), which means that you’ll not only be helping to protect the vital wildlife and reduce your exposure to potentially harmful pesticides and chemicals – you’ll also be helping to support the farmers who work hard to grow our food for generations to come. I buy organic as much as I can but it’s not always possible especially when it comes to food. When I cannot find products or foods certified organic by the Soil Association I would settle for those which are certified organic by other bodies. I am currently using Bragg’s organic apple cider vinegar and I found it better quality than vinegar from some other organic brands I tried in the past. This one is almost finished but I will be repurchasing it from Amazon this week. I mostly use it in salad dressings and what’s really good about it is that it’s raw and unfiltered, containing the ‘mother’ which is basically full of enzymes and helps with digestion. I never want to run out of Linwoods milled flaxseeds so I always keep one unopened pack in the cupboard (the opened one is in the fridge to preserve its delicate omega 3 fatty acids). I use flaxseeds pretty much every day as part of my breakfast. I add it to chia pudding or porridge. Flaxseed is not only rich in omega 3 fatty acids, it’s also rich in protein (containing around 22%), fibre and various minerals such as iron and magnesium. I normally buy it on Amazon as it’s usually cheaper on there (pack of 2). I love using raw cacao powder in my porridge or in overnight chia pudding. I bought 500g of it on Amazon from Indigo Herbs and it’s been lasting me for ages as I don’t use that much of it every day. Indigo Herbs have changed the branding since then so their packs look slightly different now. You can still buy it on Amazon though, get it here. Organic chickpeas are something I really cannot be without. They are essential for my chickpea and spinach soup which I tend to have every week. I also love having lentil salad for lunch and Sainsbury’s lentil cartons are a must for this purpose. Pasta is really quick to make so I always make sure I have some kind of pasta in my kitchen cupboard for those busy days. At the moment I am using brown rice pasta from Doves Farm. Not long ago I ditched organic vegetarian stock cubes for a Bouillon powder from Marigold. That’s because lots of stock cubes (even organic ones) contain palm oil which I wasn’t happy to consume. You can buy this powder in the majority of supermarkets I believe but I think it’s better to buy it in bulk on Amazon. I was sooo happy to discover Tree of Life organic pumpkin seeds on Amazon and that’s because I struggled to find organic pumpkin seeds which don’t come from China (one of the most polluted countries in the world!). These come from Hungary but not sure you can still find them on Amazon today. Have a browse here and check the label. I try to use pumpkin seeds every day in breakfast or salads. They are rich in zinc which helps to keep your immune system strong. Raisins are normally full of pesticides so you should always make sure you buy organic. I bought mine from a small shop in Manchester. I like adding them to porridge to sweeten it up a bit. I love having my porridge at the weekends and when it’s cold outside. Oats are really cheap, even the organic ones so if you buy something organic this month it should be this! I get mine from Unicorn Grocery in Manchester. Organic red lentils are another staple which I get from Unicorn Grocery in Manchester. They are essential for my red lentil soup which I tend to make every week! I don’t make brown rice every week as it takes longer to cook than normal rice but still, I always have brown rice in my kitchen cupboard. I normally make it with mushrooms. So these are the organic foods I like to keep in my cupboards all the time. What organic cupboard staples do you regularly buy and what’s your favourite place to buy them from? I keep some of the same products in my cupboards, it’s really sad but I like how Sainsbury’s have cardboard packaging so much easier than tins which always seem to attack me or don’t open properly lol 😀 I love Dove Farm pasta as well. That’s very true, cartons are easier to open than tins! But I prefer buying cartons because I believe tins leak BPA, however I do need to do more research about this subject to be actually clear on this. Great to hear you also choose a good quality! When it comes to Unicorn organic products I think you can only find them in Manchester in their store but I am not totally sure. I also wish I could visit Unicorn more often, I love it too! Perhaps when I move closer to Manchester I will shop there weekly.